Physicists at Princeton University led one of the two main teams that today announced the detection of the Higgs particle via its decay into two particles called bottom quarks. This pathway is the last to be detected of the five main signature pathways that can identify the Higgs particle. "We found it exactly where we expected to find it and now we can use this new pathway to study the Higgs' properties," said James Olsen, professor of physics and leader of the team at Princeton. "This has been a truly collaborative effort from the beginning and it is exciting to see the amplification of effort that comes from people working together." Long-sought because it confirms theories about the nature of matter, the Higgs particle exists only fleetingly before transforming into other, so-called "daughter" particles. Because the boson lasts only for about one septillionth of a second, researchers use the particle's offspring as evidence of its existence. These daughter particles are scattered among the shower of particles created from the collision of two protons at the Large Hadron Collider at the European Organization for Nuclear Research (CERN). The Higgs particle was observed for the first time in 2012 through three of the other modes of decay. Of these lineages or decay patterns, the decay into two bottom quarks occurs most often, making up about 60 percent of the decay events from the Higgs, according to Olsen. But at the LHC, the bottom-quark pattern is the hardest to trace back definitively to the Higgs because many other particles can also give off bottom quarks. Quarks are tiny constituents of protons, which themselves are some of the building blocks of atoms. 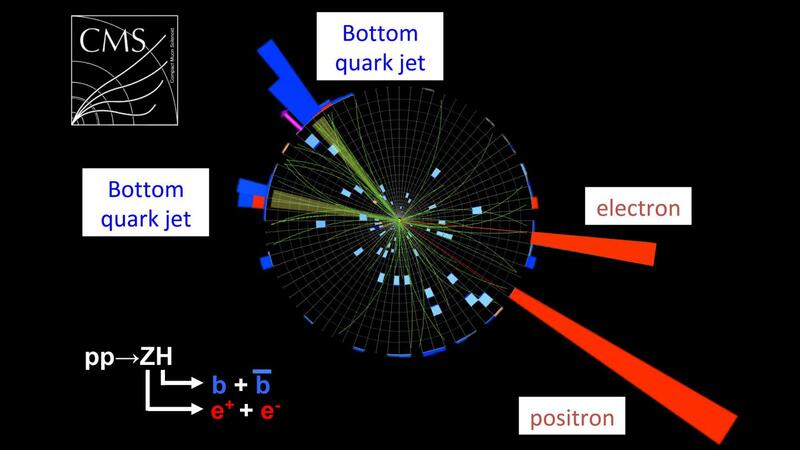 The bottom quark is one of the six types of quarks that make up the menagerie of particles in the "standard model" that explains matter and their interactions. Discerning which bottom quarks came from the Higgs versus other particles has been the main challenge facing the LHC's two Higgs detectors, the Compact Muon Solenoid (CMS) with which Olsen works, and its companion, ATLAS. The detectors operate independently and are run by separate teams of scientists. Once produced, these bottom quarks split into jets of particles, making them hard to trace back to the original parent particles. Because of this background noise, the researchers required more data than was needed for the other pathways to be sure of their finding. Both detectors are adept at spotting particles such as electrons, photons and muons, but are more challenged by quarks. The quarks due to their nature are not observed as free particles. Instead they are bound and appear as other particles such as mesons and baryons or decay quickly. "It is a messy business because you have to collect all of those jets and measure their properties to calculate the mass of the object that decayed into the jets," Olsen said. The two detectors are massive, complex structures that sit at the end of the LHC tunnel where protons are accelerated and smashed together at high energy levels. The structures contain layers of smaller detectors arranged like layers of an onion. The devices detect particles at each layer of the onion to reconstruct their paths. This allows researchers to trace the path of a particle back to its source in a manner analogous to following the trail of a firework's light back to the place where the first burst occurred. By following many of these paths, the researchers can identify where and when the Higgs first formed in the proton-proton collision. "The Higgs-to-bottom-quark decay is important because it is the most frequent decay, so a precise measurement of its rate tells us a lot about the nature of this particle," said Christopher Palmer, an associate research scholar at Princeton, who describes the work in this video. Additional Princeton researchers on the team included physics graduate student Stephane Cooperstein and undergraduate Jan Offerman, Class of 2018. The team also included collaborators at the University of Florida and Fermilab, as well as groups from Italy, Switzerland and Germany. The main challenge in detecting the bottom-quark decay mode was the amount of background bottom quarks produced by non-Higgs events. In addition to gathering more data from collisions, the researchers searched for a distinct way that the Higgs gave rise to the bottom quarks. Olsen began working on this challenge 10 years ago, before the LHC had switched on and when physicists were running simulations on computers. Around that time, Olsen learned about a theoretical study showing that it is possible to find bottom quarks created from the Higgs recoiling off another particle, such as a Z boson or a W boson. "It was an idea that nobody had before, to search for it in that channel, and the only question was whether it was possible experimentally and whether it really would pay off," Olsen said. Olsen said it is exciting to see the work come to fruition. "This is a very satisfying moment." Princeton University's research at the LHC is funded by the U.S. Department of Energy and the National Science Foundation.